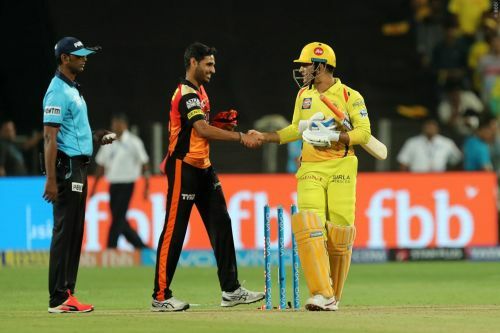 After a string of sluggish performances, Sunrisers Hyderabad are set to host the Chennai Super Kings at the Rajiv Gandhi International Cricket Stadium in the 33rd fixture of the Indian Premier League 2019 on 17th April. The hosts will look to get back to winning ways, having lost three games on the trot, while the reigning champions are just two victories away from securing their spot in the playoffs. We can expect another high-voltage drama when these two IPL giants lock horns in Hyderabad tomorrow. Sunrisers Hyderabad started their campaign on an impressive note but soon their success faded and the Orange Army found themselves amid trouble. Apart from David Warner and Jonny Bairstow, their batting line-up has been under scrutiny for the last few games. Kane Williamson made a comeback in the starting line-up in their last game, however, the Kiwi failed to mark any impression with his captaincy or his batting. SRH would be hoping to land a counterpunch when they take on the mighty CSK tomorrow. On the contrary, Chennai Super Kings have proved once again why they are the most consistent franchise in the IPL history. With seven wins and a sole defeat in their eight encounters, the defending champions are comfortably sitting at the top of the table with 14 points. MS Dhoni and company always seem to find a way to turn around any contest on its head, especially in the death overs. This is what an experienced team brings to the table - good decision-making and temperament under pressure. Imran Tahir, with his tally of 13 wickets, has been crucial for the Men in Yellow in this season. The hosts are likely to include Manish Pandey back in the playing XI. Shakib Al Hasan is likely to remain absent for the rest of the tournament as Bangladesh’s World Cup training camp begins soon. The table-toppers are likely to go ahead with an unchanged starting line-up.